- The flag of Asturias is located on the back of the neck. 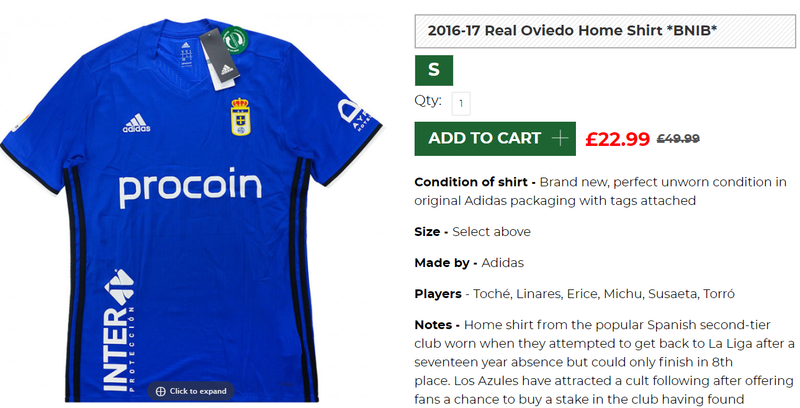 I have had my eye on a few Real Oviedo shirts over the last few years however each and everyone of them didn't have a sponsor on the front. Once this shirt appeared for sale I bought it straight away as I knew that it might be a while before they become available again. The shirt itself is really nice. The quality of the shirt is wonderful and the design of the shirt is simple. The orientation of the INTERprotección sponsor is interesting. Plus I am always a fan of shirts that place a flag somewhere on them. The financial dire straits continued into the 2012–13 season, when Oviedo called on supporters to buy shares in the club. A few footballers, notably Santi Cazorla, Juan Mata, Michu and Adrián who all started their careers there, offered their financial support in an attempt to save the club from bankruptcy – the club had until 17 November to raise €2 million in order to prevent closure. On 17 November 2012 Carlos Slim, the second richest man in the world, invested $2.5 million in the club, therefore gaining a controlling stake.